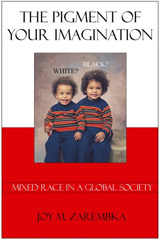 Mixed-race in a global society. Born to a Kenyan mother and a European-American father Joy and Tommy Zarembka being brother and sister look very similar. 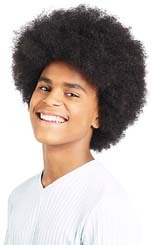 At birth however Joy was labelled as Black on birth documents and Tommy as White. How such classifications can affect a mixed-race persons life became a personal interest to Joy and after finishing a degree in Sociology and Africana Studies she began researching the subject. The result is The Pigment of Your Imagination: Mixed-Race in a Global Society, a traveller's guide to perceptions of race in different countries around the world. Joy travelled to Britain, Zimbabwe, Kenya and Jamaica and as well as her own perceptions of how people from these countries viewed her there are also some interesting personal accounts from those she met on the way. The way Joy looks is interpreted differently according to which country she is in and to a certain extent so is the treatment she receives. The Pigment of Your Imagination: Mixed-Race in a Global Society is not only a good example of the social construct of race but it also shows how closely connected race and racism are to money and power. A good piece of travel writing in its own right The Pigment of Your Imagination: Mixed-Race in a Global Society is a greatread for everyone and is available to buy now.